I've read "The Way home or face The Fire" and I continue to read it over and over again. 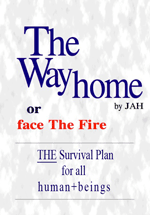 "The Way home or face The Fire" is direct from outer space to Planet Earth. Thank-You. The answer you have been looking for. Who am I? What am I? Where am I? What is the meaning of life? If you have ever looked for the answer to any of these questions, then this book is for you. If you study this book, you will find the answers to those questions. You will begin to realize that little things from your past happened for a particular reason. Things that you did not understand at the time will be made plain and you will begin to make sense of your life.